Atari CX52 Joystick Solid Gold! The problems with the Atari 5200 CX52 Joysticks have been well known for years by Atari 5200 console owners (Mushy left and right Fire Buttons that go bad, Start-Pause-Reset buttons that go bad (can not start the 5200 game) and internal CX52 Controller Flex Circuits that fail). If you found five used Atari CX52 controllers (like on E-Bay), each would have a different problem like Start buttons would not work, Left or Right or both fire buttons would not work, Controller cursor would not go all of the way left or right or up or down, Cursor shakes badly during the 5200 Super Breakout game or something is stuck inside the CX52 controller and the CX52 handle binds up. Atari CX52 Controllers put away working 2 to 10+ years ago working fine, would go bad with no use at all. New Atari Stock replacement CX52 Joystick controllers right out of the new box (sat in the Atari Sunnyvale warehouse for 2 to 6+ years) would have a very high failure rate. Even rebuilt Atari CX52 Joysticks using new Atari OEM Carbon Dot replacement stock internal silicon pads and internal Flex Circuits would with normal use, would only last 2 to 3 years between rebuilds before they would again go bad and have to be rebuilt again. Since Atari Engineering designed the Atari CX52 Joystick some 25+ years ago, Nobody except Best Electronics has done anything to improve on these problems on this Very Popular Atari Joystick. The benefits of all Gold contact surfaces have been known by the Electronics industry for years. Most high end Computers, Electronic Test Equipment and Military Spec. Electronic Equipment use Gold plated switch contacts / connectors and Gold plated printed circuit boards for Better Reliability, Low or No contact / circuit resistance and Non Corroding Non Tarnishing metal in Rough and Harsh environments. Any Atari CX52 Joystick installed with these new Best Silicone Pads with Gold contacts and Gold plated Rev. 9 Flex Circuit will just about last forever contact wise! New Gold Silicone Pad Information. 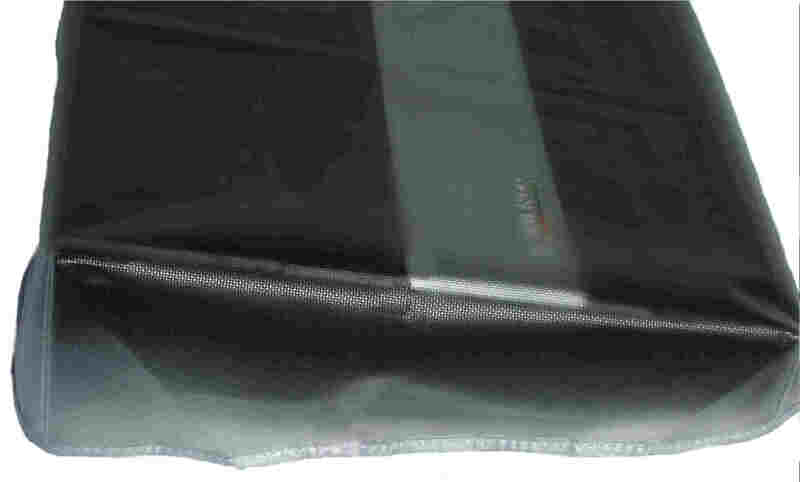 Atari was one of the First companies in the world to use Silicone contact pads with carbon dot contacts in their Joysticks on a mass-produced product. Back some 25 years ago, the Silicone pad technology was in is infancy stages back then and little was known about life expectancy, carbon contact materials, contact designs / sizes and how long Silicone pad contact pads would even last. Old Atari CX52 Joystick owners can tell you how many different feeling (Mushy) and design changes the Atari CX52 Fire buttons went thru to try and cure their known problems over the years. The All New Best Gold Silicone CX52 Fire buttons have two Major Improvements. Each New Best Molded Orange CX52 Fire button, now has two side by side 4.5 mm Gold metal contacts (slightly longer than the mating Rev. 9 Flex Circuit mating contact surface interlocking “E” Grids) for the Top and Bottom sections of the Fire button, for a Grand Total of Four Gold metal contacts per Orange Fire button. The Second Major Improvement to the all New Gold Best Electronics CX52 Orange Fire button has a Lighter but Firmer / Crisper feeling Fire Button now with a New State of the Art Tactical Feed back feature. Now each time you press on the firm Improved Best Gold dot fire button, as you release the Atari CX52 fire button, it will bounce back and give your finger a Tactical response telling you the fire button as been Pressed and Released. In a Side by Side comparison, the older series of Atari CX52 Orange fire buttons compared to the New Best Lifetime CX52 fire buttons with Gold contacts are a Night and Day Tactical difference. Mush with no Tactical feed back Vs State of the Art Tactical fire button Feed back. On the New improved / Upgraded Gold Dot CX52 Numeric Keypad, Now has Twelve 5 mm Gold Dot metal contacts. These 5 mm Gold metal contacts are some of the largest contacts ever used on any of the Atari CX52 Replacement Joystick Numeric Keypads produced over the last 35 years. The New Best Gold Dot CX52 Keypad also has the improved feel with the Tactical Feed back feature. You can now visually tell a Standard Atari CX52 Numeric Keypad from the New Best Gold improved lifetime version (and our Best Upgraded Rebuilt CX52 Joysticks) by the New Gold Colored Silk screened numbers on the numeric keypad. What do these New improved CX52 Gold Dot parts do for a Standard stock Atari CX52 Joystick? Of course, this assumes your Atari 5200 Motherboard Joystick Ports are electronically up to Factory specifications. A 5200 motherboard with weak Joystick port electronics could still have some Contact / Life Expectancy problems with an All Gold Silicone pad fitted CX52 Atari 5200 Joystick. So now, my Atari CX52 Joystick fitted with all Gold contract pads should now be a Lifetime Atari CX52 Joystick? In theory, the Best Gold CX52 Joystick Silicone pads should last the useable life of the CX52 Joystick. Each New CX52 Gold Dot Silicone replacement pad is rated by our Manufacture for over 300,000 actuation cycles per Silicone pad. Although it is possible to physically wear thru the silicone pads top surfaces (and we have seen some rare cases of wear holes thru the tops of the silicone pads on old exchanged CX52 Joysticks over the last 19 years) after hundreds of thousands of cycles of use, Most Atari 5200 CX52 Joystick owners will never have to replace their CX52 Silicone contact pads again. In the real world, you may have to still replace the Atari CX52 Joystick handle Rubber Boots, Potentiometers and Cables as they possibly wear out after many years and years of normal use. What are the Costs of the New Best CX52 All Gold Joystick Silicone pads? New 2nd Generation late 2012 design Gold Fire buttons with Tactical feed back feature. CO20501-GT $7 per fire button (New Gold Fire buttons are sold as a matched set of 2 Gold fire buttons with one Gold Numeric Keypad). For more information on the new 2nd Generation Gold Dot fire buttons click here. The price of Gold has tripled since our last production run of Gold plated Rev. 9 Flex Circuits. We have no choice but to raise the cost of the Upgraded Gold plated Rev. 9 Flex Circuits and also limit the Qty per Customer to 2 Gold Plated Flex Circuits for now. Best Electronics is now shipping the second generation CX52 Joystick Gold Numeric pads with increased pressure to push each keypad number and a much improved tactical feed back bounce back (more tactical bounce back than the 2nd Generation gold dot 2nd gen. fire buttons) on each upgraded keypad number. Fortunately all of the other Best New 1st generation Gold dot CX52 replacement parts were bought in large enough Qtys (production runs), we do not have to raise any of other New CX52 Gold dot part prices until we have to reorder them again, sometime in the future. Because of the Very High cost of the New tooling Molds to make the above New Improved / Upgraded / Lifetime Atari CX52 Joystick Gold version Silicone Pads, the Gold Fire buttons (2 each) will be sold with a Gold version numeric keypad as a matched set of 3 Only, until further notice. John N. of NY John contacted Best and said "hello, just came across your website and it's fantastic. I need full button and gold circuit for the Atari 5200 controller. How much for the new circuit board, fire buttons, keypad and start/pause/etc button setup? Can't wait to get this controller back up and running!" John ordered one complete set of Best CX52 Gold lifetime parts for his 30+ year old Atari CX52 Joystick. "Got the items and fixed my controller!! Works like a charm!!! Thank you so much." Follow up Comment: "It was fantastic to be able to use this system, especially since I never had it as a kid!" Mike M. of NC Mike's 1st contact (via E-Mail) with Best, he said he had just picked an Atari 5200 console and of course it had two bad carbon dot CX52 Joysticks. He asked Bests advice on the new CX52 Joystick parts he should get. He was considering mixing some working to a degree old Carbon dot parts with Best's CX52 Gold Lifetime Joystick parts. Best told Mike if he was on a budget, go with a full set of new Atari Carbon dot CX52 Joystick parts (good for about 3 to 4 years of normal use, before they will have to be rebuilt again). If he wanted to end up with Lifetime CX52 Joysticks, go with all Gold CX52 parts. 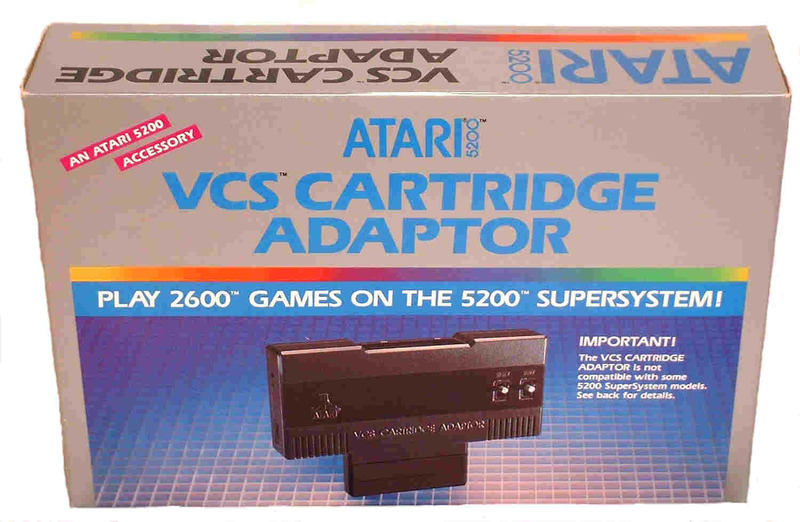 Upon placing a second Atari order in a row with Best, Mike said: "Hi, picked up a 7800 this week. Also wanted to say how awesome the gold parts were to fix those old joysticks on the 5200. Night and day and worth the extra cash. Nice to know that they won’t fail. Follow up Comment: "Sure on use my feedback. So glad I found your company and happy to promote it. I do on Atariage as well." Jeff J. of FL Jeff contacted Best via E-Mail. He want to upgrade his two old non working carbon dot pad Atari 5200 CX52 Joysticks with Bests exclusive New Lifetime upgraded CX52 Joystick Silicon pads with Gold Metal dots. "I just wanted to send you a quick message to let you know that the parts already arrived. I appreciate your excellent communication, and ultra quick order processing time. The buttons exceed my expectations all around. They are tactile, and responsive just like you described. No more mushy CX52 controllers! Thank you so much, and have a great day!" Jim F. of AZ. Jim ordered two sets of Bests exclusive made CX52 Gold dot Lifetime upgrade parts for two bad Atari 5200 CX52 carbon dot Joysticks he had. "Thank you, thank you, thank you! The order of the 5200 Controller Replacement Parts (Gold) arrived quickly with exactly what I ordered. Best of all, in no time flat my two Atari 5200 controllers were fully functional! I used rubber cement, as your site suggested, to secure the flex circuits. Once everything was back together, they worked! No fiddling needed. Galaxian, here I come!" Charles L. of WI Charles placed on order on Thursday, for 2 sets of Best CX52 Joystick Gold dot Lifetime replacement parts. "Thank you so much for the super fast shipment! I had the parts in time to rebuild the controllers this weekend and they worked great! The controllers are better than new! Thanks for offering these parts to enthusiasts!" Kit W. of APO (US Military person) Europe Kit picked up several sets of Bests CX52 Joystick Gold Lifetime upgrade parts. "My last two purchases have been on point. The 5200 controllers and the 5200 silver bezel makes my console seem like a new 5200. The 5200 trackball now works flawless as well, makes me happy you guys are there to get what I need." Jeff K. of PA Jeff picked a set of Bests New all Gold 5200 Atari CX52 Joystick upgrade parts that turns an old Atari CX52 Joystick that had its problems ever since they were 1st made some 25 to 30+ years ago, into a Lifetime CX52 Gold Joystick. "I just wanted to thank you so much for the new Gold updates for my 5200 controllers. I have never enjoyed Gremlins and Gyruss as much as I am now! Thank you!!" Follow up Comment: "I still cant believe how incredible my joysticks are running right now. The responsiveness is amazing! I am fairly certain that if the OEM ones ran like these do, the console would have been much more successful. I am just so thankful that a company like yours exists, to ensure that future generations get to experience the magic that is Atari! Never stop doing what you do best! Nathan H. of WI "I got my new Gold dot pads and flex circuit this past week and I have to say I am thrilled at how much those really did work!" Aaron S. of KS "I just want to thank you guys for all your help fixing my Atari 5200. The Gold dot buttons and keypads are fantastic"
Ken W. of NC "Just to let you know that I finally got around to installing all of the Gold Dot replacement parts in my 5200 controller. It's cliché I know but it really is a the difference between night and day. It's like the thing is brand new. No more literally making my thumbs numb and sore from pushing those infernal side buttons in with the equivalent force one would apply to try to dent steel. Just thought that I'd let you know how much I love those Gold dot parts"
I installed a couple sets of your New Atari Gold upgraded CX52 Joysticks Silicone Pad sets and Flex Circuits. I notice that the upper left New fire button does not have the same excellent New Tactical Feed back feature as compared to the lower fire button. With the new sets of improved Best CX52 Silicone pads with Gold contacts, it is Critical that the Flex Circuit be re-glued flat to their back mounting plates (under the Numeric keypad by the Flex Circuit Hump and left / right fire buttons). 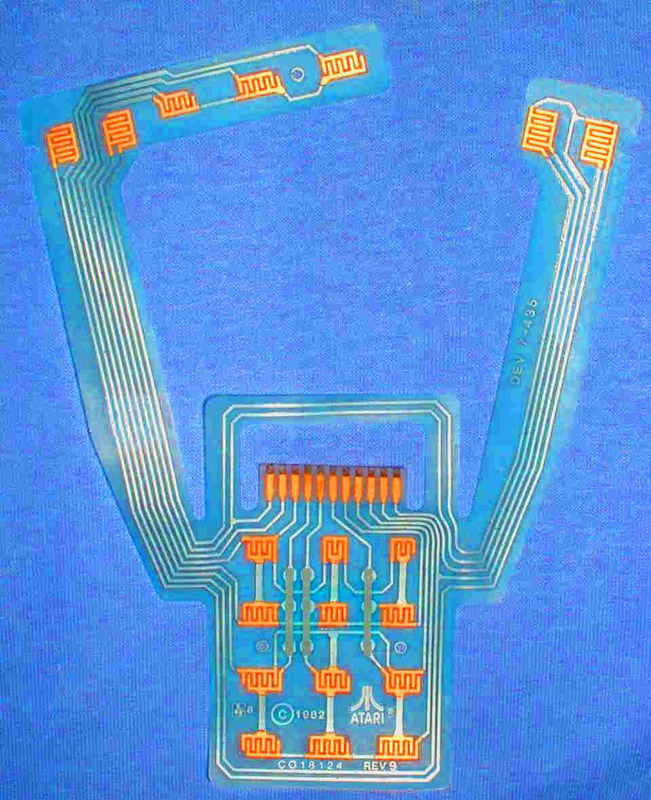 We find rubber cement (instead of Atari used double sided clear tape) works very well on holding the New Gold Flex Circuits flat against their Mounting plates. On the Old Rev. 9 Flex Circuits and Triple Dot fire buttons (and other versions), the Flex Circuits could float between the bottom of the Fire button pad and mounting back plate and still function OK. With these Mushy Fire buttons, you would Never notice the difference. On all of the Atari CX52 Joysticks made, you will find that the Top left fire button will not have the exact same new Tactical feel as compared to the right top fire button. This is because of a lack of Internal Plastic Support / backing behind the flex circuit as it passed thru to the top case assembly. The Top left fire button bottom rectangular support pad is only supported on three sides instead of the normal 4 sides. Another way you can double check this, is to reverse the left Gold Dot fire button 180 degrees in its fire button bezel, reinstall. You will find that the bottom fire button now has the Good Tactical feed back and the Top Fire button now has less tactical feedback. I notice that the top row of numbers (1 – 3) on my freshly rebuilt CX52 with Lifetime Gold Dot Silicone Numeric keypad do not have the same excellent tactical feel as the others. Assuming you have Glued down the Rev. 9 Gold Flex Circuit to the top of the internal numeric Keypad support plate, Yes you will notice that the Top Row numbers (1 – 3) on the Gold Dot numeric Keypad will not have the same exact new tactical feed back. This is because of the fixed internal design of the CX52 Keypad internal support plate. 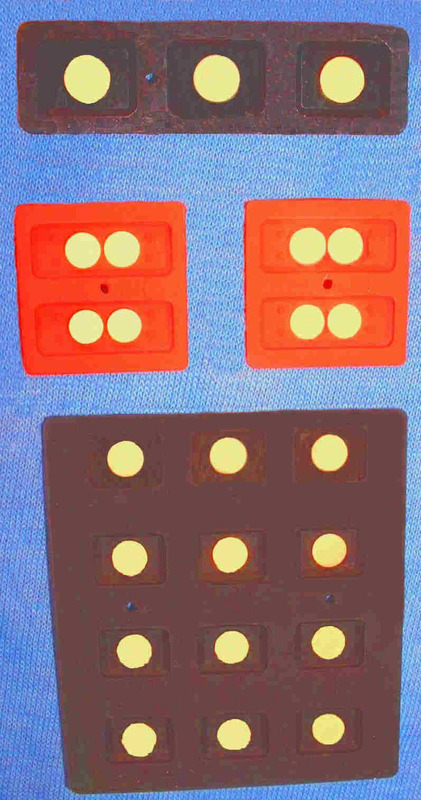 This support plate has a top rounded edge and does not give enough support (three sides instead of 4 on each 1 – 3 number push pads) to the New Gold Dot numeric Silicone pad along the very top edge. This is not noticeable on the older design carbon dot Mushy CX52 numeric keypad pads, but is on the upgraded Gold Dot Keypad. Will you still carry the Standard Atari 5200 CX52 Joystick Carbon dot replacement Silicone Pads and Stock Flex Circuit parts? I am not mechanically inclined and do not want to try to rebuild (or do not have any cores CX52 to exchange) my old Atari CX52 Joystick(s). What are your prices for your Best Reconditioned Standard and Upgraded with Lifetime Gold Dot Silicone pads Atari CX52 Joysticks? *Exchanged Core / used CX52 Joysticks must have all of the Stock plastic parts, with no cuts or damaged cables. Missing or damaged Silicone pads / boots is OK.
What is the current US Shipping charge on Exchanged or Out right buys on Best’s Reconditioned CX52 Joysticks? We have a Flat rate shipping charge for US / Domestic shipped Atari CX52 reconditioned Joysticks. $14.20 Priority Mail for 1 (Insurance included) or 2 CX52 Joysticks (for 2 CX52 Joysticks exchanged add $2.80 Insurance to the total). California Residents must add their local CA Sales tax to the total. CA sales tax is based on the CX52 Controller(s) cost only (not on insurance or shipping charges). When sending some old Atari CX52 core(s) for exchange, it is best to include your full return ship to address with phone number with a copy of any E-Mails we have sent you, a US Postal Money order made out to Best Electronics. Any other form of Mail order payments, like a personal check, other type or brands of Money Orders or Casher's checks can take up to a month or more to clear thru our Atari Accounting department and that Atari Mail order released to our Atari shipping department. We simply do not receive very many Personal Checks, other brand of Money orders or Cashiers Checks for Atari Mail order payments any more. So we are very lucky to do a once a month or less bank deposit of any personal checks or money order Atari Mail order payments. We go to the US Post Office almost 7 days a week here. Click here for Best's ship to Information. International Atari Customers E-Mail us at bestelec@concentric.net us for shipping Reconditioned / Upgraded CX52 Gold Joysticks or Bests Gold CX52 parts to your International location. Zach R. of WI Zach took advantage of Bests Atari CX52 5200 Joystick Exchange program. He sent in two old non working Carbon Dot CX52 Joysticks for 2 Reconditioned / Upgraded Best CX52 Lifetime Gold Joysticks. "Just wanted to let you know I got the controllers back today and they’re working well. 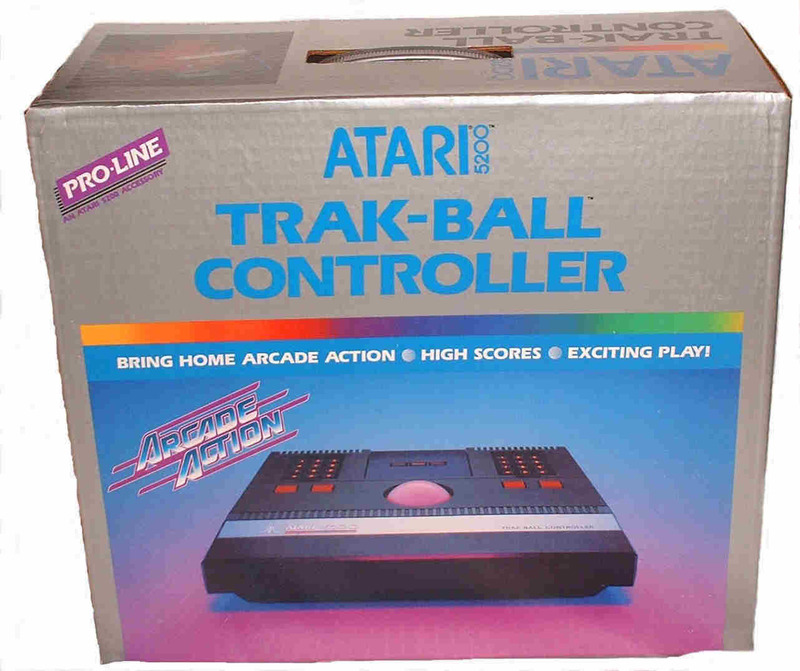 Thank you for the super fast turnaround time and service"
David P. of FL "I want to sincerely thank you guys for the two CX52 Atari 5200 controllers with the Gold dot revisions that I purchased from you around 2006. When I received them they were great, and outperformed my original controllers even when they were brand new. Around 2010, the Atari went into storage, kids were into their own systems and it wasn’t getting any fair play. Now, my “kids” are young adults and they were feeling nostalgic and asked about the Atari, so I pulled it out of storage, hooked it up and the controllers worked flawlessly as soon as they were plugged in! I feel this is a testament to the quality craftsmanship that Best Electronics put into both the design of the upgrade parts as well as the workmanship invested in the controller rebuild process. Many thanks!!!" 30+ year Atari 5200 History has shown, if David went with the Carbon dot version freshly rebuilt CX52 Joysticks back in 2006, they would of gone bad after 4 to 5 years of storage. Michael K. of CT. Michael purchased one of Bests Reconditioned / Upgraded Gold CX52 Joysticks. I've been using my upgraded Gold CX-52 for about a month now, and it works flawlessly. Best has an excellent reputation in the Atari community, and it is well earned. I'm continually impressed with Best's customer service and their commitment to quality product. I definitely recommend anyone interested in making an Atari purchase should contact Best Electronics. Thomas B. of MT. Thomas sent in two old CX2 Joystick controllers in for exchange for two Best CX52 Reconditioned / Upgraded Gold Joystick controllers, the most cost effective method. "Got the controllers today and they work great! Had a blast playing games with my kids today"
Aaron L. of TX. Aaron has placed 3 to 4 different Atari orders with Best Electronics. This time Aaron wanted take advantage of Best's CX52 Exchange Joystick program (the most cost effective method) and send in two CX52 Joystick cores for exchange for some of Bests Reconditioned / Upgraded CX52 Gold dot Lifetime Joysticks "Wow! These CX52 Gold Joysticks have completely exceeded my (high) expectations! They are a pleasure to use and make the 5200 as it should always have been. Thanks for your continued efforts on this front! Realsports Baseball is so much fun to play with these joysticks!!" Aaron did notice a minor problem on his 5200 console, where the game cursor on some 5200 games would not go to the far right. He read the Best CX52 Joystick trouble shooting sheet that we include with each Best CX52 Gold Joystick. One E-Mail back and forth to Aaron, Best concluded that his 35+ year Atari 5200 console had drifted off the Atari Factory 5200 port settings very very slightly. So Aaron arranged to Call Best Electronics with his 5200 console near the phone and Best talked him thru the very very minor port adjustment Aaron had to do on his old 5200 motherboard. A total time on the phone of less that 5 minutes and Aaron's 35+ year old Atari 5200 console was again back to the Atari 5200 Factory port settings. All of Aarons 5200 game cursor problems of not going the far right went away. Ray D. of PA. Ray took advantage of Bests CX52 Joystick exchange program (the most cost effective method) and sent in two old carbon dot used / non working Atari CX52 Joysticks for exchange toward two of Bests Reconditioned / Upgraded CX52 Gold dot lifetime Atari 5200 Joysticks. "Thanks, received them yesterday, and they’re awesome!" Joey S. of Canada. Joey sent in two old Atari CX52 non working Joysticks for exchange, for some of Bests Reconditioned / Upgraded all Gold lifetime CX52 Joysticks. "Just wanted to drop a quick note to let you know that I received the controllers and had a chance to give one of the sticks a play. Holy cow! These are top notch! I was enjoying my 5200 before by using a 2600 stick and a redemption box but I couldn't enjoy the analog control games. The analog sticks are wonderful... sure there are games like PAC man that benefit from a digital stick by the 5200 sticks are awesome for Star Wars arcade and others! Overall, I am a satisfied customer and Would recommend these refurbished sticks to anyone with a 5200!" Mark of DE. Mark placed his 1st Atari order with Best Electronics in February 2016. He ordered one of Best Reconditioned / Upgraded 5200 CX52 Gold Lifetime Joysticks. Placing his second order with Best in May 2016 he said: "By the way, The controller I ordered from you is still working fantastically. Love playing my 5200 everyday." Rick V. of VT. On Ricks 1st order to Best, he picked up (did an exchange, sent in his old CX52 Joystick cores) for two of our Reconditioned / Upgraded CX52 Gold lifetime Joysticks. About ready to place his 2nd Atari order with Best. "I have been super happy with my CX-52’s by the way! Thanks again for providing that great service." Mark S. of OR. Mark purchased Bests Reconditioned / Upgraded Atari 5200 CX52 all Gold Joysticks with second gen. Gold dot fire buttons with the new tactical feed back feature. "I just wanted to take a second to let you know (again) how happy we are with the 5200 controllers and the other devices/games I have purchased over the last couple of months. The quality of the Best refurbished 5200 controllers in particular was reinforced to me over this weekend, when I found one of my friends had an old 5200, which started a conversation about the controllers and we got his out and started playing it. Night and day difference… if I had to play using his stock controllers, I would not be interested in the 5200 at all." Marks forth feed back comment to Best. Mike M. of OR. Ready to place his third Atari order with Best. "I really like the 2 Reconditioned / Upgraded CX52 Gold Joysticks I picked up last month, like enough so that I would like to pick up 2 more to round out my 4-port system." This is Mikes second feed back comment to Best. Michael W. of TN Michael ordered one of Best reconditioned / upgraded Gold CX52 Joystick with 2nd Gen. Tactical feed back Gold Dot fire buttons. "I received my 5200 controller yesterday. After a minor adjustment of the consoles potentiometer, it works great! Thank you for the super fast shipping! I enjoyed reading the article inserts as well. Keep up the good work. You are an asset to the Atari retro gaming community." Ton P. of PA. Ton sent in two CX52 cores for exchange toward some of Best CX52 Gold Lifetime controllers. He also picked up a new CX5200 console Translucent Dust controller and a New in the shrunk wrapped box Atari 5200 Moon Patrol game. "I received everything and was able to test it today -- It all works brilliantly! Thank you so much for the great controllers and awesome service!" Follow up Comment: "I'm so happy with everything I received from you!" Brice Z. of Canada. Best sent Brice one of our Reconditioned / Upgraded Gold Lifetime CX52 Joysticks. "I received the reconditioned 5200 controller (almost 3 weeks ago) and it works flawlessly. Shipping was very fast and the environmentally friendlier packaging (with biodegradable foam peanuts) is a nice touch." Keith C. of TX. "Hello Best Electronics, I am sending this message to say how unbelievably happy I am with my purchase from you. The 5200 controller is simply amazing!!!" Bests Reconditioned / Upgraded Gold Dot CX52 Joystick with the New 2nd Gen. Tactical Fire buttons. "It is immaculate and plays flawlessly! Thank You Best Electronics! You made my day with these controllers and a happy gamer! You got yourselves a future customer! BTW you told me I would get my order by this Friday. And I got it today on Monday!?!?!? Lightning fast!! Thanks for everything!!! You guys are simply THE BEST!!! I will recommend all my retro gaming friends to you! THANKS A MILLION GUYS!!! A+++++++++++++++:-)"
James A. of CO. "the new, refurbished 5200 controllers are FANTASTIC!" Bests Reconditioned Upgraded 5200 Gold CX52 Joysticks. R. Diaz of NY. "I recently ordered 2 of the Gold Rebuilt Controllers from you and they work great" "Please send me 2 more Reconditioned CX52 Gold lifetime Controllers with a replacement 5200 4 port motherboard." Stephen J. of WA. "The Gold CX52 joysticks are excellent .. I really appreciate the quality and the support you provide." Bruce P. of NJ. "I received it today" Best reconditioned/upgraded CX52 Gold Joystick "and it exceeds my expectations! Thanks so much for a fantastic product as well as a fantastic service." Matt J. of IN. "I just received my refurbished CX52 controllers today" Best Reconditioned / Upgraded Gold CX52 Joysticks "and I have to say I am absolutely blown away...WOW! All the buttons feel amazing and while I haven't had time to hook them up and play yet, I have a feeling they will be worlds better than the old version." How do I order some Upgraded Atari CX52 Joystick(s) with the new Lifetime Gold dot pad sets? If you have some CX52 Joystick Core(s) you want to exchange, then box them up (no padded bags) drop in a personal check (see above costs) and a note with your ship to address and phone number. We recommend you send them to us (Best Ship to address on first web page) Priority Mail with Delivery Confirmation. If you do not have any CX52 Cores to exchange and want to out right buy some freshly Rebuilt / Upgraded CX52 Joystick, you can Call In (phone hours on first web page) a Credit Card order or arrange (Via E-Mail at bestelec@concentric.net) a different payment method. Joe S. of MN "Thanks again for your assistance with calibrating my Atari 5200 console." Joe had exchanged out some old non working Atari CX52 Joysticks for Best Reconditioned CX52 Joysticks. When Joe received the Best Reconditioned CX52 Joysticks, he was having some problems with one of the two Best reconditioned CX52 Joysticks he had received. We explained to Joe that all Atari CX52 Joysticks Bests reconditions are tested on Atari Factory consoles that are calibrated to Atari 5200 Engineering Spec's using Atari 5200 Diagnostic hardware. During the Best reconditioning process, each reconditioned Atari CX52 Joystick is tested on several different Atari 5200 Consoles using several different Atari 5200 Game Cartridges and then are put into our stock. Just before the Reconditioned CX52 Joysticks are sent out, they again go into our Atari Tech's area to be again tested on Factory spec Atari 5200 consoles. We explained to Joe, that we have found over the last 34+ years selling Atari CX52 Joysticks, that some of the Atari 5200 consoles have electronically drifted off the Atari 5200 Factory Joystick port settings, casing the one reconditioned CX52 Joystick problem Joe was having. We explained that we can help Joe do the minor internal setting adjustment over the phone within his 5200 console to get his one Best CX52 Joystick problem corrected. "Controllers are working great! Kids and I are having a blast! Thanks"
What is the usual Turn around time on the exchanged Reconditioned CX52 Joysticks? On Phone orders for Non Exchange CX52 Joysticks, they are usually shipped the next working day. On Exchanged CX52 Joysticks sent in, they are usually shipped within one or two working days (depending the the payment method used see shipping costs information above) after we receive your CX52 Core(s) from you. What do you normally replace on your Best Reconditioned / Upgraded CX52 Joysticks? Best Electronics knew in late 2011 that we were going to run out of the New 2005 production run of the 1st generation of Atari CX52 Joystick Gold Dot fire buttons sometime in late 2012. So in an effort to continue to support the World Wide Atari 5200 owners with matched sets of CX52 Joystick Gold Dot Silicon pads that turn the old failing or bad Atari CX52 Carbon dot Joysticks into Lifetime upgraded Gold Atari CX52 Joystick controllers. So early in 2012 we started to work on the next generation Atari CX52 Gold dot fire button project. At Best we are always trying to improve on the original Atari products (Composite Video out and OS upgrades for Atari 2600 and 7800 consoles, Gold CX40 Lifetime PCB boards which turn old Atari CX40 Joysticks into a lifetime Joystick, CX30 Replacement Super Pots that turn old worn out Atari Paddles into lifetime Paddles). We felt that we could do one better on the next Generation Gold Dot CX52 Fire Buttons (which cured for ever the known 25+ year 5200 Joystick fire button failure problem, which thousands and thousands of Atari 5200 Joystick World Wide Owners have found out since 2005) when we started this new project. After close to 9 months of work on this new 5200 project, a brand New design CX52 Gold Dot Fire button mold ($,$$$) (we scraped out the 2005 new fire button mold, because it could not be upgraded to our new fire button design standards), and what seemed like hundreds and hundreds of new prototype samples of Rev. 2 Gold Dot CX52 Fire button samples Received and Rejected over and over. Best Electronics is now proud to announce the New 2nd generation CX52 Joystick Gold Dot Fire buttons with a New Tactile feed back feature! Any old Atari 5200 owner can tell you CX52 Joystick carbon dot fire buttons went thru many changes over a 5 to 15 year period as Atari Engineering tried to fix many different CX5200 Joystick fire button problems. Small Carbon dots, Medium Carbon dots to Larger Carbon dots and toward the end, one set of triple small carbon dots on each top and another set of 3 carbon dots on bottom orange CX52 Fire button and so on. Also the feel (when the fire button was pressed and released) of each Carbon dot fire button changed over the years from mushy, to spongy and in the end neutral feeling Carbon dot CX52 fire buttons. All of these Atari Engineering CX52 Carbon dot Fire Button fixes, never cured the known CX52 Joystick fire button failures until the Best Gold Dot Fire button final cure. When we designed and released the 1st Generation CX52 Gold Dot fire buttons in mid 2005, Gold was selling for $535 per ounce. In late 2012, Gold is now selling for around about $1,720+ an ounce. Even though the price of Gold has been going up and up in 2013, the New 2nd Generation Best Gold Dot fire buttons, now have over double the amount of Gold plating thickness on the 4 metal dots on each new Silicon fire button compared to the 1st Generation Best CX52 Joystick Gold Dot fire buttons. Because of the Original Atari Engineering CX52 joystick bottom plastic case design (which has not changed over the total life span of all CX52 Joystick bottom plastic controller cases made) the upper CX52 Joystick fire button silicon pad does not have the same plastic back support around the bottom / base of the upper fire button to properly support it. You will find on the 2nd Generation Tactile Gold Dot fire buttons, only the bottom CX52 controller Gold fire button will have the New improved Tactile feed back feature and the top Gold fire button will have a reduced tactile feed back because of the lack of internal plastic support (CX52 bottom controller case) at the base of the top fire button Silicon pad area. You can feel / test this basic CX52 joystick top fire button design / support problem / difference by installing 2nd Generation Gold Dot Fire button in a CX52 Joystick bottom case. Press the bottom CX52 orange fire button and feel the tactile feedback and increased pressure to push it down. Now rotate that same bottom CX52 Joystick Fire button and brown plastic fire button bezel / holder 180 degrees into the top position and then reinsert back into to the CX52 bottom case (now the bottom Gold dot fire button is in the top CX52 Joystick position). You will now see that when the top fire button (which was the bottom fire button with good Tactical feed back) is pushed again, it does not have the same good Tactile feed back as compared to new bottom fire button. So this top fire button reduced tactical feed back problem is a design flaw in the basic Atari CX52 Joystick bottom case design, which was never corrected or even addressed by Atari Engineering, because at that time, Atari did not have any Carbon Dot fire buttons with any kind of Tactical feed back features back 25+ years ago. You will find that about 90 to 95% of the Atari and 3rd Party made 5200 game cartridges, only use the bottom Fire button. The New cost for the 2nd Generation Best CX52 Gold Dot Fire buttons is $7 each (two per CX52 Joystick controller). Again each set of 2 new 2nd Generation Atari Gold Dot Fire buttons are sold as matched set of 2 Gold Dot Fire buttons with a New CX52 Gold dot numeric Keypad. We have a small quantity of the 1st Generation CX52 orange Gold Dot Fire Buttons left in stock. When those sell out, Best Electronics will No Longer produce or sell the 1st Generation CX52 Gold Dot Fire buttons. At that point we will 100% switch over to only selling the 2nd Generation Gold dot fire button replacement upgraded parts and Reconditioned / Upgraded Gold lifetime CX52 Joysticks. For more information, customer reviews and to see the original Information on the Best CX52 Gold Dot 5200 Joystick cure, click here or scroll up to the top of this 5200 page. Limited supply on some 5200 Titles, some titles only one is in stock, sold and a first come first serve basis! We Suggest when placing orders for 5200 Cartridges, you always have a 2nd and 3rd choice of the same dollar value 5200 Game cartridge listed, in case your 1st choice has sold out. This allows us to process your order faster and Not have to issue Credits, Refunds or try to contact you by phone or mail. Non Atari Titles (Boxed) Activisions Pitfall (Pitfall is for 4 Port 5200 models only), Space Shuttle (Simulator) $15 ea. Activisions Zone Ranger $20 ea. Atari 5200 4 port console Information Tip: The Atari 5200 4 Port (can insert up to 4 Atari CX52 Joysticks in the front) consoles use a custom made CX522 Atari Auto switching switch box unique to the Atari 5200 4 Port console only. 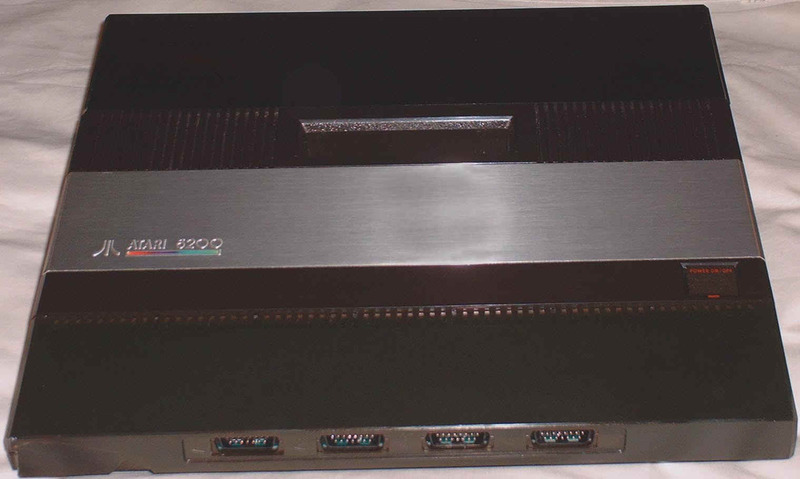 (click here to see a picture of it) When you 1st see a 5200 4 port console, you will see the Heavy Duty RF cable (stores under the 5200 console bottom case), a channel 2 / 3 rear switch on the back bottom case, but no where on the Top or Bottom 5200 case set is there a 5200 Power Supply jack on the 5200 4 port console. The 5200 external Power supply is plugged into the Atari CX522 5200 4 port Custom Switch box which attaches to your TV / Display. When you push the On / Off button on the main 5200 4 port console, the 5200 Power is sent from the Custom Atari 5200 TV Switch box down the single 5200 RF cable to the 5200 console to power it and the 5200 RF TV signal is sent back up the same RF cable to the TV switch box. So you did not have move the mechanical slide switch lever (Game Console or TV positions) on most older mechanical TV switch boxes of that vintage. 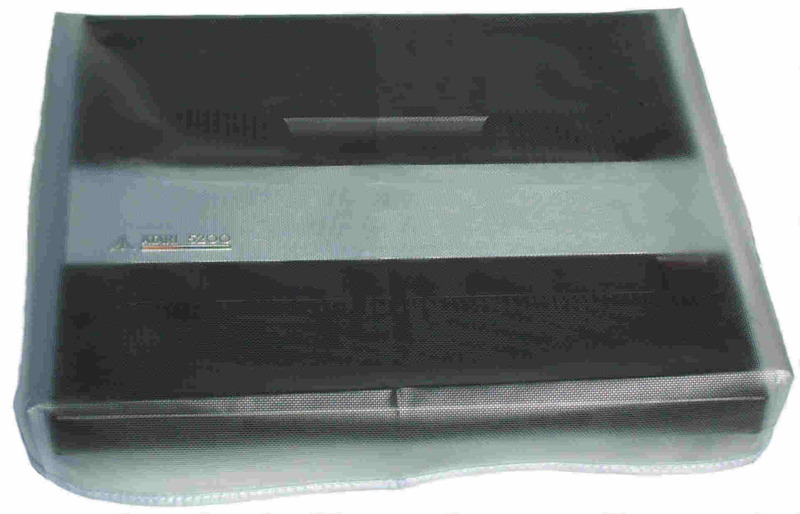 This Atari design 5200 Auto Switching TV Switch box was about 10 to 15 years ahead of its time. Other newer vintage Game consoles used a similar auto switching TV switch box about 10 to 15 years after Atari 5200 innovation and it became an Video Game industry standard on just about all video game consoles now. One of the more common comments we hear from 5200 4 port new and getting back into the 5200 4 port consoles, is when I put the 5200 Power Supply connector into the CX522 Custom TV Switch box, I saw a large spark between the end of the 5200 Power Supply barrel connector and the Mating Power Supply connector on the CX522 Atari 5200 Custom TV switch box. This happens because the 5200 CX522 Custom Switch box is trying to power up the 5200 motherboard circuits (but not turn it one) when you plug in the 5200 power supply connector. So you end up doing a live power connection, thus causing the spark you see. The proper way to connect up a 5200 4 port console, is to first make the RF connection (5200 Heavy Duty RF cable to the CX522 Auto switch box), next plug the Coax cable connector on CX522 TV Switch box to the TV / Display coax in connection, next the 5200 Power Supply barrel connector to the 5200 CX522 Custom Switch box without the other end of the 5200 Power supply (110V) plugged into the wall socket. The very last thing you do is to plug the Atari 5200 Power supply connector into the 110V wall socket. This way you avoid getting the large spark between the 5200 Power supply barrel connector and the Custom Atari 5200 CX522 4 port TV switch box connector and possibly damaging it! Some 65 different Text Version (typed) Game Instructions for 5200 Cartridges are Now Available, E-Mail us at bestelec@concentric.net for Titles $3 ea.